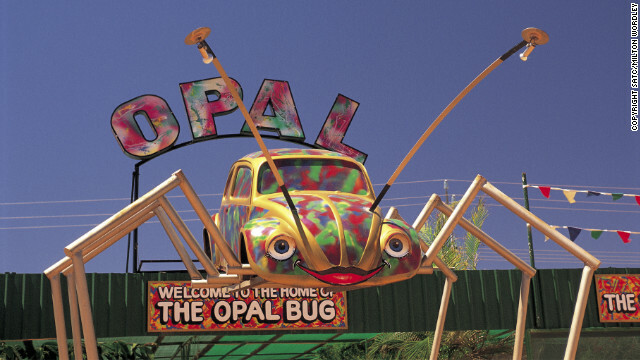 In the outback of Australia, there is a region where opal mining reigns supreme. 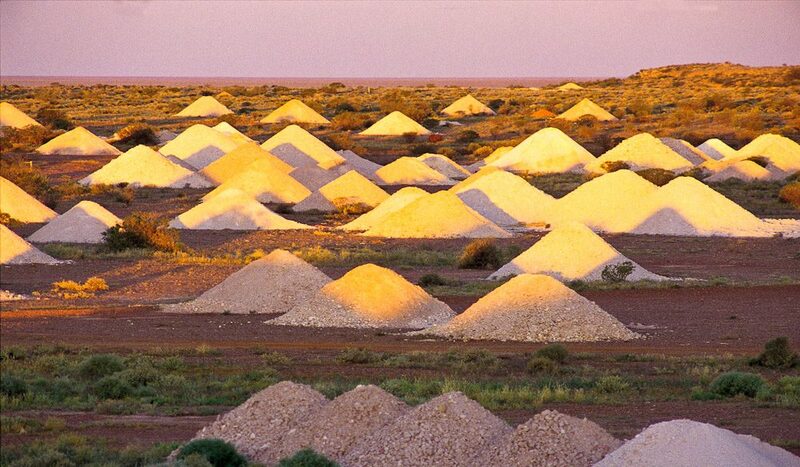 The tailings, from afar, look like like white piles of rock, waiting for further processing. The landscape is bleak. 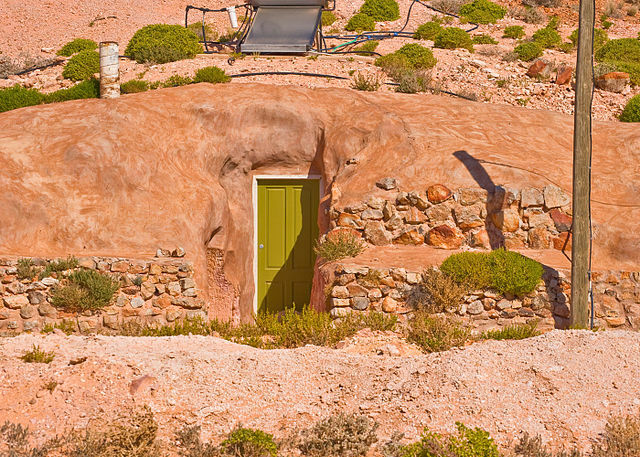 A little town has gathered itself there, called Coober Pedy. What makes this town of less than 1700 unique, more than just a hot speck in a harsh land, are the dwellings some locals have constructed. Shades of hobbit tales, many have built houses, B&Bs, hotels, and bars inside the mining shafts, creating dozens of Star Wars-like homes and businesses. A story from www.adelaidenow.com in January, 2014, notes that "SOUTH Australia is sitting on oil potentially worth more than $20 trillion, independent reports claim - enough to turn Australia into a self-sufficient fuel producer. Brisbane company Linc Energy yesterday released two reports, based on drilling and seismic exploration, estimating the amount of oil in the as yet untapped Arckaringa Basin surrounding Coober Pedy ranging from 3.5 billion to 233 billion barrels of oil. At the higher end, this would be "several times bigger than all of the oil in Australia", Linc managing director Peter Bond said. This has the potential to turn Australia from an oil importer to an oil exporter." —Humanity's influence on a warming climate is "clear" and has accelerated since the 1950s largely due to burning oil, coal, and other fossil fuels that release atmosphere-warming greenhouse gases. —Global warming is already harming agriculture, the environment, and human health in real ways worldwide. —Greenhouse gas emissions rates have accelerated since 1970, with the steepest increase coming in the past decade. About 80 percent of those emissions are tied to fossil fuel use. The worst effects of climate change include acidified oceans, higher sea levels, and crop losses." So, in every country, decisions are ahead. 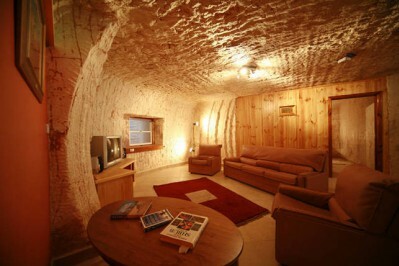 In Coober Pedy, Australia, a future as either an oil importer or exporter looms even as climate change reports continue to sound alarms. Those houses are fascinating. It's nice to see people fitting into what's already created rather than building McMansions at any cost.